our expertise to transform your wish to reality. inspiration. Our team will get in touch shortly to gather all the details of your project. We are ready to walk you through our work process. Feel welcome to upload photo of inspiration to start your carpet journey. File type: jpg & png format with a max of 10 MB per file. 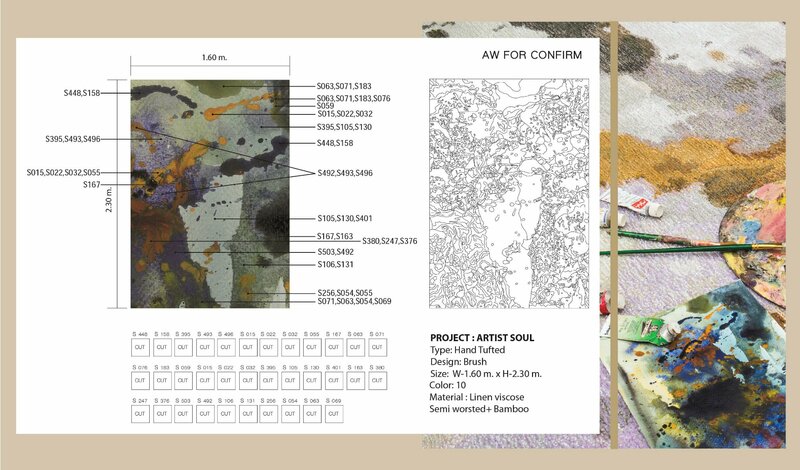 With more 3 decades of experience on our carpet production journey enables our professional team to precisely interpret and execute the aspiration behind your inquiry. Think of us as your own carpet factory, your reliable friend and inspired partner who selects only premium materials, shares technical advice and is excited to turn your imagination into one of a kind creation. Our team will come up with an artwork proposal which visualizes what you have in mind, and we will promptly produce a smart sample for your approval. Once the smart sample is approved, it's time for our craftsmen to turn your dream into reality. Their expertise derives from a heritage of weaving. Only the best carpet materials, including New-Zealand wool, silk, linen, bamboo and tougher mixed fibers are carefully selected for all our rugs. Their exceptional qualities combine with our traditional artisanship and superior technique to produce a world-class carpet with exquisite features. We cover all shipment with worry-free service. Our logistics team supports you continuously, making sure your carpets reach their destination within your time frame. We have a delivery service to the front door of your house/building. Complex import regulations and customs troubles are taken care of for you. Even small order, we can make it happen. Feel welcome to let our representative know your preference.